First of all, I’d like to extend a huge thank you to the NCTJ for scheduling my exams on the same days as Radio 1 Rock Week. No, really, you shouldn’t have. Second, how exciting does this line-up look? The Radio 1 Rock Week has a great reputation for creating awesome live gigs – last year, for instance, included great acts such as Enter Shikari, Frank Turner, Mallory Knox and Don Broco. Personally, I like the look of Monday’s line-up best – Of Mice & Men are one of my favourite bands at the moment. However, Mallory Knox are returning to Rock Week for the second year in a row, which just goes to show how awesome they are to have beem given the honour again. Plus, Lower Than Atlantis’s new single is awesome, and I’d love to hear it live. The worst thing about these gigs is that there are only 60 pairs of tickets up for grabs at each event. That means only 120 people will be able to witness these awesome nights, and because of my exams I won’t be one of them. Sad face. Thankfully all three gigs will be broadcast live from the legendary Maida Vale studios on Zane Lowe’s Radio 1 show, so I can listen along in my bedroom whilst pretending to revise. If you’re lucky enough to be available during the Radio 1 Rock Week, there’s still time to apply for tickets! More information can be found here. I think I can speak for most Pure Love fans when I say I did not want this tour to happen. Last night was the opening night of the band’s farewell tour, before going on “indefinite hiatus“. The band’s first and only album, Anthems, has seen massive popularity since its release in 2013, as well as cult popularity thanks to the band’s presence on Twitter and Instagram. Now I, personally, would have loved to see We Are The Ocean as the support act, as I saw them play with Pure Love in support of Lostprophets in 2012. Well, that’s the line-up I imagined in my dreams anyway. However, in reality the night started with PUP. These guys were a lot of fun to listen to, but I didn’t think much of their lead vocalist. 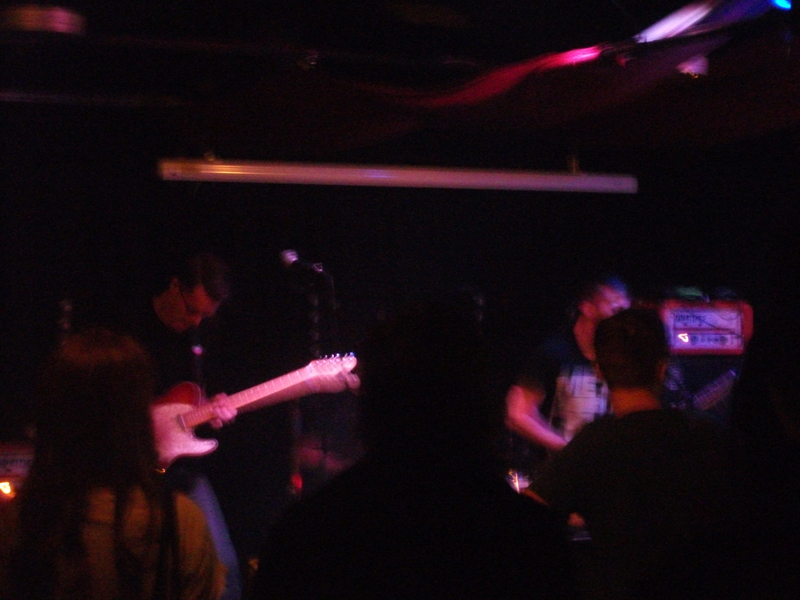 Also, they’re a lot heavier than Pure Love, so they probably would have been better suited to support a heavier band. Unfortunately my camera ran out of battery pretty quickly, so I only have one photo of their performance, and it’s a little blurry. And then, on to Pure Love. These guys were phenomenal. Their live performance was polished and well-rehearsed, and Frank’s vocals were spot-on throughout the performance. Performance is the only word I could use to describe this show. The show was electric, and I think Frank and Jim spent more time in the crowd than on the stage itself. They were literally hanging from the rafters of the venue at one point, only a couple of feet from where I was stood, which was an awesome sight to see. During their final song, Riot Song, the entire band moved their kit from the stage to the middle of the crowd, making the performance even more intimate and getting even the most reluctant members of the crowd jumping. During one of the quieter moments of the gig. I know this photo isn’t amazing, but I had to include it because of THAT HAIR. Looks like Frank literally raised the roof last night. I’ve run out of ceiling-related puns. Sorry guys. My ticket didn’t get ripped on the way in. Does that mean it’s special? All in all, last night was a concert I’ll probably never forget. Their last gig was a perfect farewell from a brilliant, if short-lived band.I guarantee that if Pure Love ever get back together, I’ll be buying tickets to their next tour as soon as they go on sale.